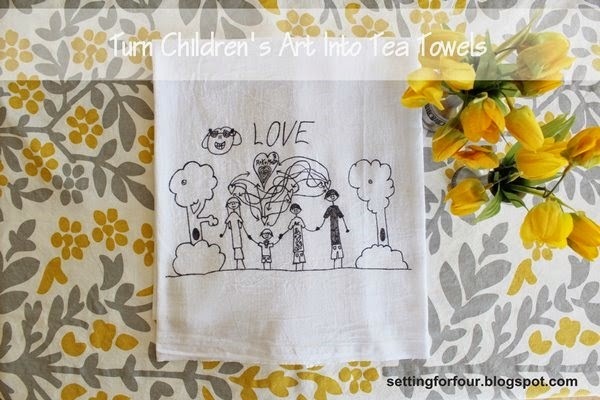 See this fun childrens art activity: How To Turn Childrens Art Into Tea Towels! A kids craft idea that’s fun to make with the kids and give to grandparents and family! Do you have piles of artwork that your kids have brought home from school, daycare or made at home? 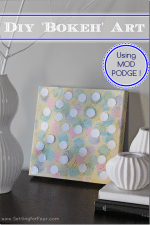 Want another way to display their artwork other than hanging it on the fridge or framing it? 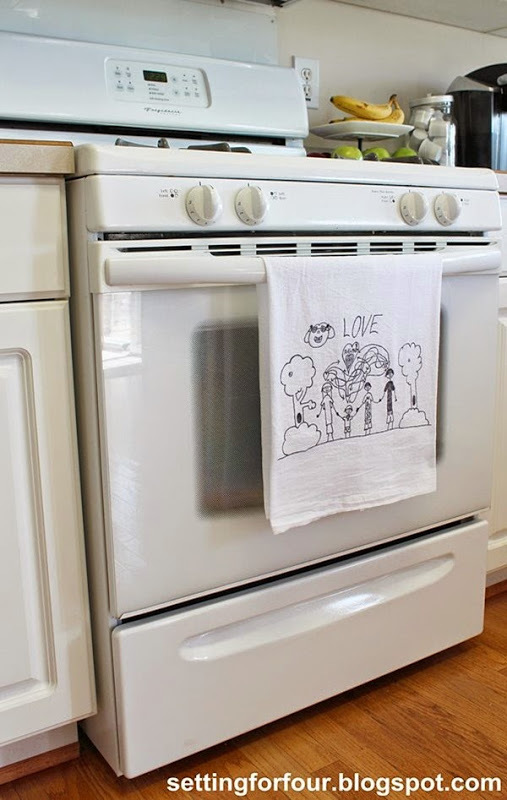 Here’s a fantastic way to display your kid’s art in a space we spend a lot of the time in – the kitchen! 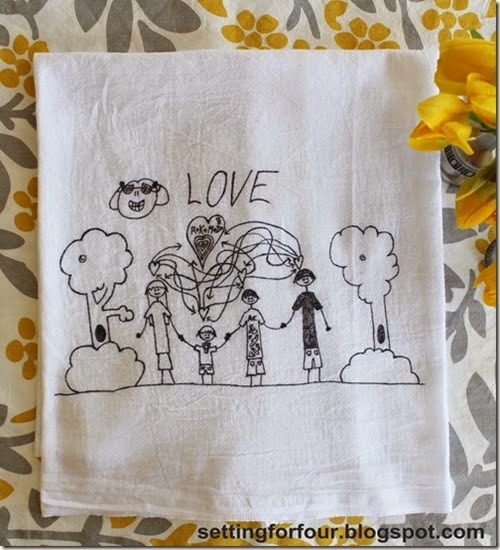 Turn your kid’s art into DIY tea towels: your kiddos will feel so special and proud to see their drawings on display. This would also be an excellent gift idea for grandparents, aunts, uncles and teachers! Birthdays, Christmas or ‘just because’! I’m sharing with you how to make it! See more of this DIY project by using the arrows below. 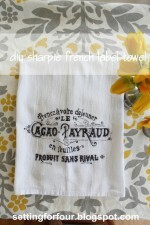 This is a great way to repurpose a regular white tea towel. It’s also a fun home decor idea to decorate the kitchen! Can you imagine your child’s surprise and delight when they see this hanging on the oven door? They will absolutely be thrilled that you gave their artwork a permanent place in the kitchen for everyone to see everyday! My son was so flattered and thought it was a very ‘cool’ idea! 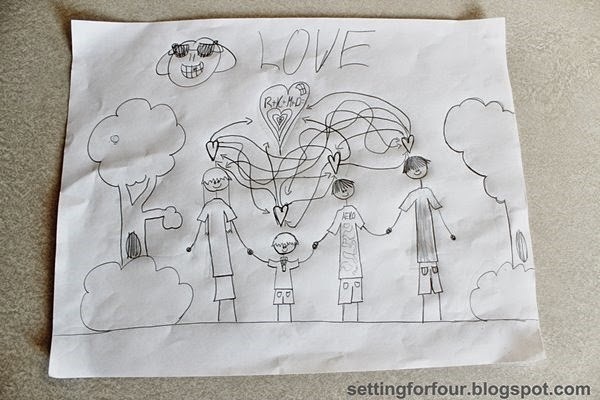 Choose a picture your child has drawn – this is the perfect kids art activity to do together! Below is the picture I used for my tea towel project. This picture just makes me smile every time I look at it and now I can have it in my kitchen to admire too! Isn’t he a terrific artist? Look at all the love arrows we have going on here, and the cheery sun with sunglasses! So adorable! – White flour sack towels. Use the arrows below to see the instructions! So cool! I love this idea. I have a laser printer, does it only work with an ink copy? So so cute – can’t wait to try it! Such a good idea! “Pinning” it! This is so adorable! I need to make one! This is so cute Heather! Such an adorable idea! I never would have thought of it- but I can think of a million people who would love to receive it as a gift! Great job! How have you been? Did you have a good holiday weekend? What a cute idea–could be great for a teacher gift! Fabulous idea. The children would love their artwork shared like this. Aww…how cute! Thanks for linking to Things I’ve Done Thursday! I love this idea! Out come the boxes of artwork! Oh! These are darling. It’s such a cute way to appreciate your kid’s artwork. Thanks for sharing this. What a terrific idea and so simple!! Definitely a great gift for the grandparents! Thanks so much!! Very cute idea Heather! My in-laws would love this! So cute! I’ll have to wait until my little one can work a pen – I can’t imagine this works as well with fingerpaint creations 🙂 But when that day comes, someone’s getting some tea towels! hope to see you there! and I’m absolutely pinning this! Such a sweet, clever idea!! I’ve pinned it and now I’m sharing on FB!! Oh my gosh! This is adorable. What a great way to keep your child’s art work. I need to remember this for when I have kids. Great Great idea. Thanks for sharing! I just found you on Cherished Bliss. Love this idea! I just saw you’re featured at Tip Junkie’s top 10 today! Congrats- this project is so unique- it deserves to be spotlighted! Great job, girl! So cute! How do you wash the towels? Thanks! Precious and clever. What an amazing gift idea! Thanks so much for sharing this at The Winthrop Chronicles, this will be featured at tomorrow’s link party! Wonderful idea!! It’s so creative and unique! This is great and I will be doing it! But does the sharpie come out in the wash or is it permanent? What temperature do you wash them at? Just give the kids the towels to decorate ~ colored sharpies work great also. Will the sharpie come off after washes?? Awesome idea!! Thanks Trisha!! The permanent marker holds up when washed. I have washed mine many times and it still looks great! No bleeding at all. Hervin02, Trisha and Jessicakays: I responded to your questions however just realized that you are ‘no reply bloggers’ which means that when you email a blogger, unfortunately they can’t email you back….due to this issue my replies to your questions did not get delivered to you. You can fix this by adjusting your Blogger profile settings. Hope that helps! I will post the answers to your questions here in the hopes that you can get the info: The sharpie is a permanent marker, so the graphic will be permanent…the graphic on my towels do not disappear or bleed out in the wash. I wash mine in cold water and hang to dry since they dry so quickly there is no need to dry them in the dryer! Good luck! Correction: When a person COMMENTS on a post and they are a ‘no reply blogger’ this means that the blogger that received the comment can’t reply to it…. Just pinned this today and wanted to stop by and tell you how much I love this idea! I think it will make great gifts for the grandparents too! Thanks so much for sharing this! Thanks for the sweet comments! Grandparents will love this DIY!!! Have fun making one or two or three! So glad you like this Rebecca!! Send me a pic of it when you are finished – I would love to see how your version turns out! I love mine and my son is so proud that his art is now in our kitchen! I have 10 grandchildren and 1 more on the way. This would be a great idea for a Christmas present for the parents! Thanks so much! It really would HanoverGirl! Both the parents and the kiddos would enjoy seeing their art in the kitchen! You are so lucky to have 10 grandchildren!!!! What a great idea Genie to use Magnadoodle creations! Great suggestion! I have kept some artwork thru the years of my kids. Now they are married. I am going to do this for my daughters in law of their hubbys childhood art. I am thinking of embroidering it as well. Thanks for the idea. How does the permanen marker do in the wash? Great idea!! Your daughters in law will love that – how sentimental! The permanent marker holds up really well when washed. I have washed mine many times and it still looks great! Send me a picture of your version, I would love to see how it turns out! What a testament to a loving family! R drew so much love into his art! Your welcome! I am sure the grandparents will love it! The permanent marker holds up really well when washed. I have washed mine many times and it still looks great! No bleeding at all. 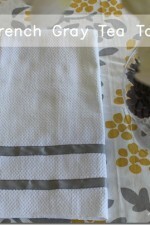 I purchased the flour sack towels at Wallmart – but have also seen them at Target…hope this info helps! Your tutorial is thorough, and inspiring. I know this is something I will be trying. R, you show a lot of love in your art! our children’s art this way too. Thanks Kaysi…I will pass your compliments on to my son! I just made one- it’s adorable! Can I iron it? Yes you can! Email me a pic – I would love to see how your’s turned out! Yay!!! Very cute. However, I got plain undies for my son and I drew things that he liked on them with Sharpies to make potty training more fun, and they really faded in the wash. Has this happened for you?? I don’t want to spend a lot of time tracing if it’s just going to fade and look bad. Cute idea! Sharpie is not archival, which means that over time, you will get a yellow halo around your marker lines. I would suggest trying an archival marker, or maybe a fabric marker instead of a standard sharpie if you want your towel to last for a long time. I’ll keep that in mind Roelofs….mine have not shown any yellowing. They turned out great! Love your little artists’ drawings! So cute! Thanks for adding the link to my post that inspired you! I am sure the grandparents will love these as gifts! Thanks Heather for your sweet comments 🙂 I will pass on your compliments to my son! He loves to draw and I am always encouraging him! Great idea! I think I will do something like this for myself using artwork I have been saving for many years! Could you use colored sharpies? I believe that would work! I have only used black but the ink type is the same…so it should work! R has inspired me to make some. Thanks so much for the fabulous tutorial. Have fun making them Cheri! What a sweet idea to make some with your neice for family! Such a thoughtful gift! Glad you like these! Can they just draw on the towel? 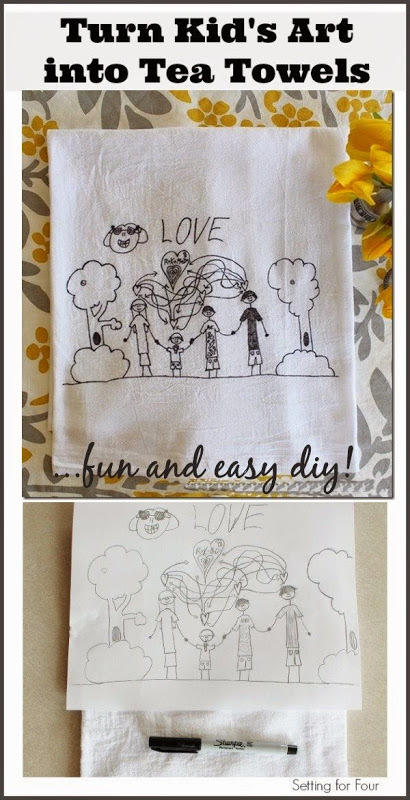 Yes, your kiddos can draw on the towel with a sharpie marker! We’ve actually found that regular permanent Sharpie lasts BETTER through the wash than laundry markers (which largely washed out, for us). Jeanne and A Viintage Industry – If you feel confident in your drawing skills you could draw it right on to the towel otherwise you could try tracing it! Hi Rose – you can freehand trace or trace the way you mentioned..whatever works for you! Thanks for visiting!! This is an adorable idea–but what I am REALLY in love with is that yellow and grey patterned fabric! Can you tell me what it is, where it’s from? I used a regular tip! I just found your blog today through Pinterest….I love this idea and I think i would like to try and make some for my mom (great-grandma) and my daughter….My grandson Xavier loves to draw and I think this will make a really fun gift that we can update every year for Valentines Day…. AHHH I love these! I just figured out this years mother’s day gift craft idea! Can anyone recommend where to buy towels like these? Thanks! Elise- I included a link in the post where you can buy them online! 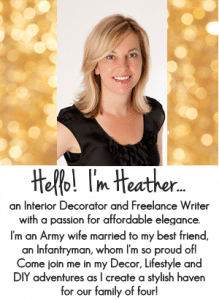 Heather, what a great project and I’m loving the artsy one very much! Re: your comment about your apparent long torso and short legs, actually if you picture where your waist is in the picture, it’s fairly proportionally correct to the rest of the body AND he’s got you all in the latest fashion!!! :). Very impressive! Thanks for the post, I love it!! Thanks Mimmi – I’ll pass your compliment onto my artist son who drew it! He’ll be thrilled you said that!! So easy! Thanks for sharing it, great idea! One could also make cloth napkins with corners or borders done with features from this same drawing, so they coordinate. I am curating a collection of Sharpie projects for Looksisquare(dot)com. I don’t know if you’re familiar with Looksi but it’s a lot like CraftGawker: they display a thumbnail image from your blog along with a short description and a link. Typically you would submit your own images (like you do on CraftGawker) but they also have curators (like myself) who do theme based round ups. I’d like to include this project if you’re okay with that–I’m assuming the permanent marker you used was a Sharpie or at least sharpie-like. I would need to crop out your watermark (similar to CraftGawker) but if people want to see what you did or how you did it, they need to click on the link. Would that be okay with you? Just let me know! This is such a fun idea! Thank you! What a great idea! Can’t wait to get busy on this one! Great artwork on yours by the way! I love that idea Heather and I think I’m going to do this with my Son as a Grandparents gift – they’ll really like it!! Thanks and Pinning too. This is wonderful! I saw this from Tip Junkie and just had to stop by and say “great job!” Love it. Pinning. This is an absolutely darling idea! Your little budding artist is quite talented! 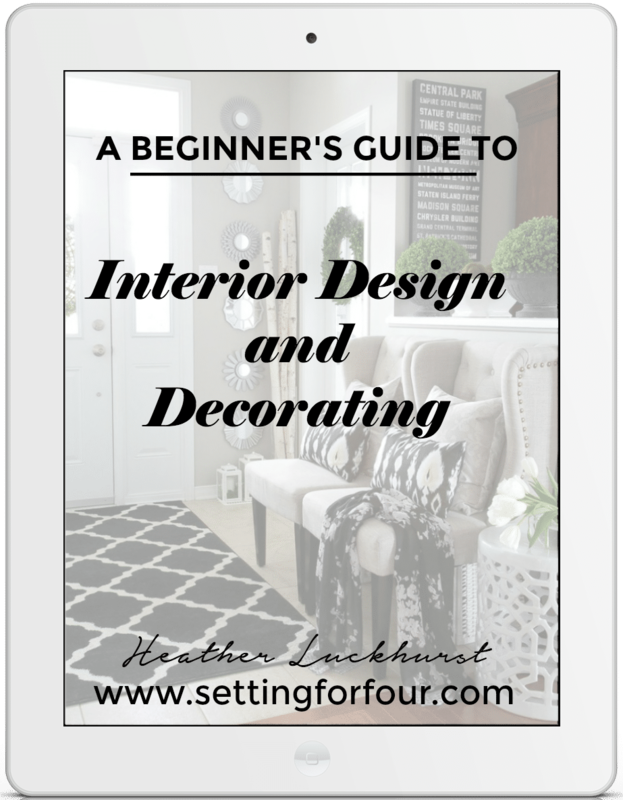 I’d love for you to link this up to my new Creative Ways Link Party! Hope to see you there! Have a Happy Mother’s Day! 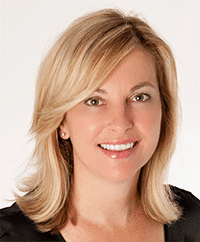 stopping by from tidy mom linky (we are onlinesisterhood). These are wonderful tea towel! Pinned. As requested…”R” if you are still reading the comments….this is a great project AND just in time for mothers day! I have an 8 year old daughter (and a 5 year old daughter and 3 year old son….and we live way down here in the country of Brazil) who will just think this is the funnest project to make for me. Thank you for sharing your art work:) Have a great weekend. I used recipes in my grandmother’s handwriting for family gifts. You have wonderfully creative children… such a blessing! I love the detail of his pictures thanks for sharing will do this with my 6 year old son’s artwork. Thank you Jessie – you are so sweet and thoughtful to say that! My boys are my world and yes they are so creative and talented – my husband and I are truly blessed! 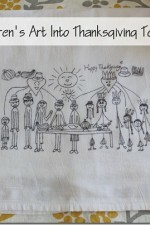 Have fun making this tea towel with your son’s artistic creeations!! Thanks for leaving such kind supportive compliments Belinda! 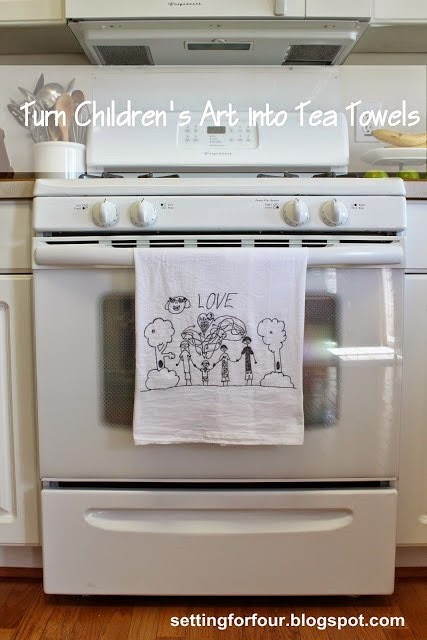 Hi i saw your tutorial about drawing your kids art on to tea towels.. I gave a question which I hope you can answer.. Do you think I can use a red permanent pen rather than black would it work just as good? Hi Emma – I’ve never tried a pen, I’ve only used permanent markers, so I’m not sure it would work or not to be honest! You can use a red permanent marker though! I hope that helps! Oh my gosh Jennifer! That’s awful that they bled! I’ve made several of these towels and none of them have bled in the wash – I’m wondering if maybe the marker you used – was it a permanent marker? Ok, I think I must be missing something,…. how do you see the pic if the towel is on top? The floursack towels are light enough that I could see the drawing underneath Shelly! Love this idea! 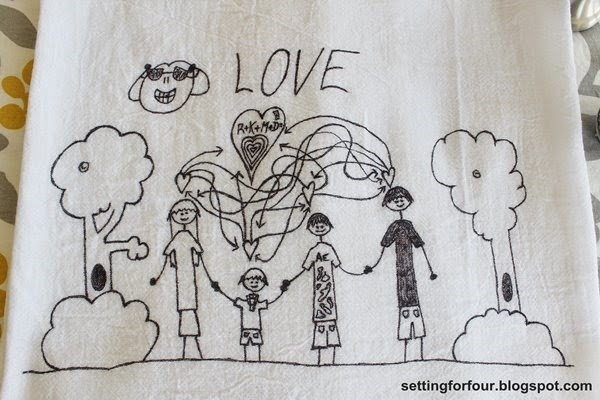 I used fabric markers and let my toddlers draw directly on the tea towels. It was a great present for their great grandma! I was able to find high quality tea towels at my local quilt shop. So far, they have held up wonderfully and other family members are asking for some some kid crafted towels. Great way to preserve their artwork!! Great work R. I just knew mom did it, until I read more. Very creative. You must be an amazing son to capture Love this way. Job well done mom and dad! I pinning now to save for later! Btw, my previous comment wasn’t meant to push the little guy out start earning a living LOL After rereading my post the last part aimed at the artist himself, may not come across as lighthearted as I had intended, to some folks. Apologies! Great idea, thank you for sharing. I know this is an old post so R I hope you are still being very creative with your drawings! The picture your mom used for this post is adorable. Hi, this is adorable. Did you trace the drawing? Love this idea! Sometimes I feel bad about getting rid of the artwork but this is a fun way to keep it and make each child feel special! 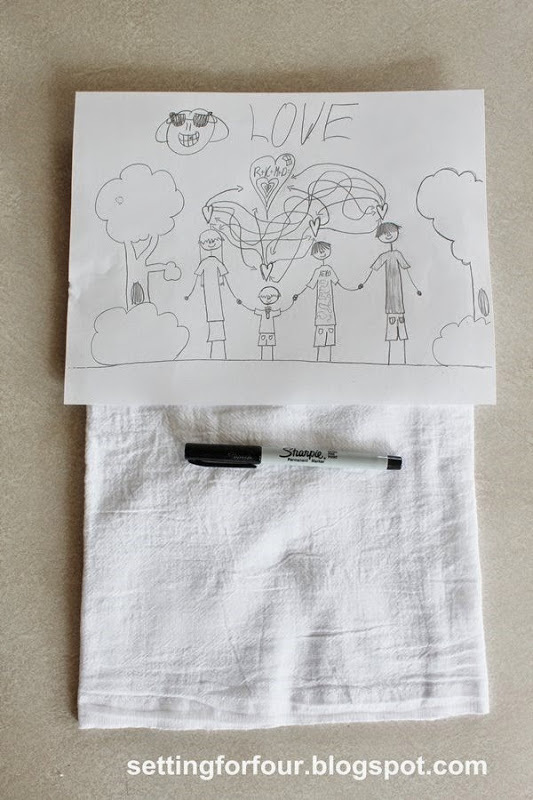 Would this work if I had the kids draw their picture directly on the tea towel? Hi Aubrey! Yes it will work – as long as they use the marker I linked to in the post! Have fun!